Quinoa has exploded onto the health food scene over the past several years as a grain that’s also a great source of protein and fiber. 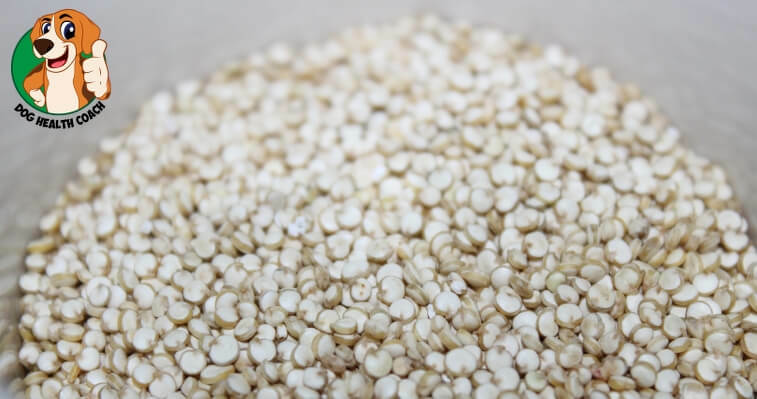 Unlike potatoes, rice, and other starches, quinoa has a lighter texture, and acts as a grain, even though it’s really unlike any other carbohydrate-laden grain out there! It’s become an incredibly healthy choice for people looking to make better nutrition decisions, but is it safe for dogs? Quinoa is absolutely safe for dogs! In fact, it can actually offer your dog the same nutritional benefits you enjoy when you eat it yourself. As with anything new you may be introducing to your dog, it’s a good idea to start with a small cooked portion, first to see if your dog likes it, and to see how their body may respond to it. Quinoa is still a grain, and while it is a healthier option, it is higher in calories than most fruits and vegetables, so it’s important to consider moderation, especially in dogs who are less active, and can over-eat easily. If your dog is very active, and gets a lot of exercise, quinoa can be a great way to ‘fuel up’ with extra energy! Plus, it’s loaded with calcium, iron, niacin, and healthy fats your dog needs to be at the top of their game. If you start out small, and make sure quinoa isn’t the main staple of your dog’s diet, it can be a healthy addition to what they already may be eating, especially if they lead a more active lifestyle. Looking for more healthy foods you can share with your dog to give them even more nutritional benefits? Check out our lists of healthy fruits and vegetables your dog can enjoy, while getting a nutritional boost in every bite.